It’s Showtime, ladies and gentlemen! After three intense weeks of voting on each game in the series, we’re finally ready to kick off Round 1 of our Best Dungeon tournament. The best dungeon in each title has been decided, the brackets have been set, and the true clash of champions is ready to begin. We begin this premier round with the winning dungeons from Oracle of Seasons and Four Swords Adventures. Note: The dungeons featured in our wild card round received the least votes of any dungeon in Round 0, therefore they must earn a spot in Round 1. 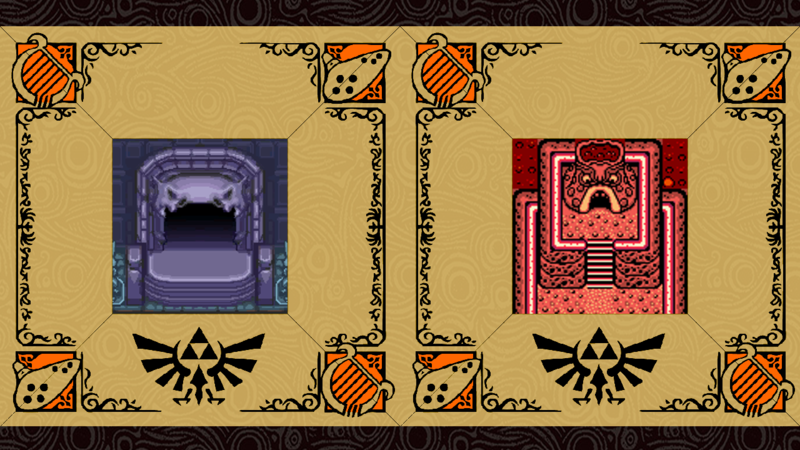 The Sword & Shield Maze serves as the final dungeon of Link’s adventure in Holodrum, his final test before confronting the nefarious General Onox. Situated in the mouth of a volcano, this labyrinth presents an interesting theme of polarity. Its basement sports fire and lava as one would expect, but its upper chambers are curiously covered in ice. The mini-boss Frypolar further emphasizes this dichotomy, as it alternates between fire and ice attacks. With treacherous ice floors and deadly lava pools, this dungeon is a true challenge. And the music is great too. The Temple of Darkness acts as a turning point in Link’s Four Sword adventure. After travelling into the dark world to confront Vaati and Dark Link, our heroes finally learn of a secret hidden away in this dark temple. The structure houses the fabled Dark Mirror, and a greater evil has exploited its power for sinister gains. The temple exhibits a uniquely dark aesthetic, as a shadowy haze permeates throughout and many rooms lay in pitch blackness. The four Links fight there way through hordes of undead enemies and are ultimately met with the surprise return of a familiar foe.